Oh, I bet you thought this was never coming! You can find the first half of the giant list of fete and fair tutorials and printables here, along with the criteria I used to decide on what was included and what I left out. Chalkboard Serving Platter by Wit and Whistle. Paper Fortune Cookies by design wash rinse repeat. Clay bird ornament by JessicaJane Handmade. Owl cushion by button bird designs. Pillowcase shopping bag by Grow Mama. Rice filled heating Owls for children by Just another Hang Up. Tea Bag gift Tag by The Studio Of Mae. DIY ice cream sundae box by family bits. 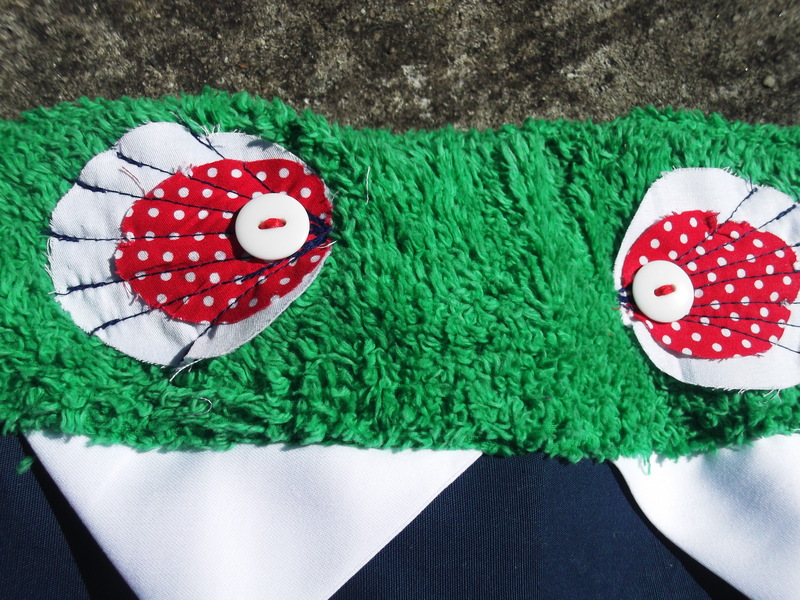 Monster bibs by stubbornly crafty. Cloud and rain mobile by dailylike recipe? 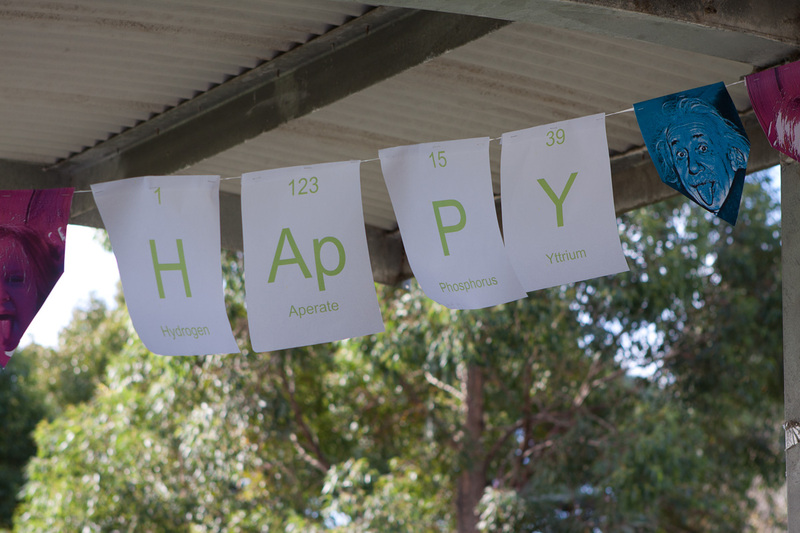 Bunting by the yvestown blog. Lunchsacks by All people quilt. Enjoy….and let me know if you think you might make anything. Yes, the monsters are back! Lately…. I mixed together two of my favourite creative gifts into a monster/fort mash-up. Previously,I have made fort kits for gifts. I got the idea from saltwater kids, who got it at Bloom. 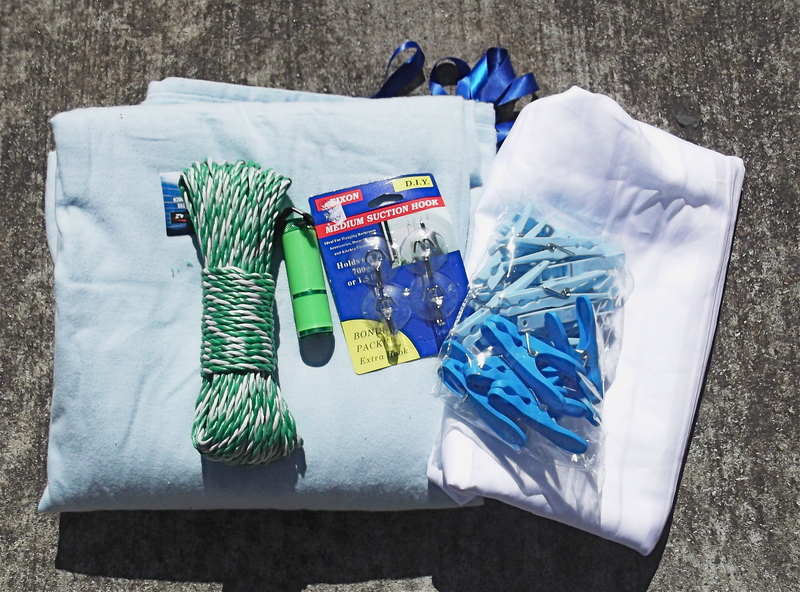 The contents of the monster pillow. 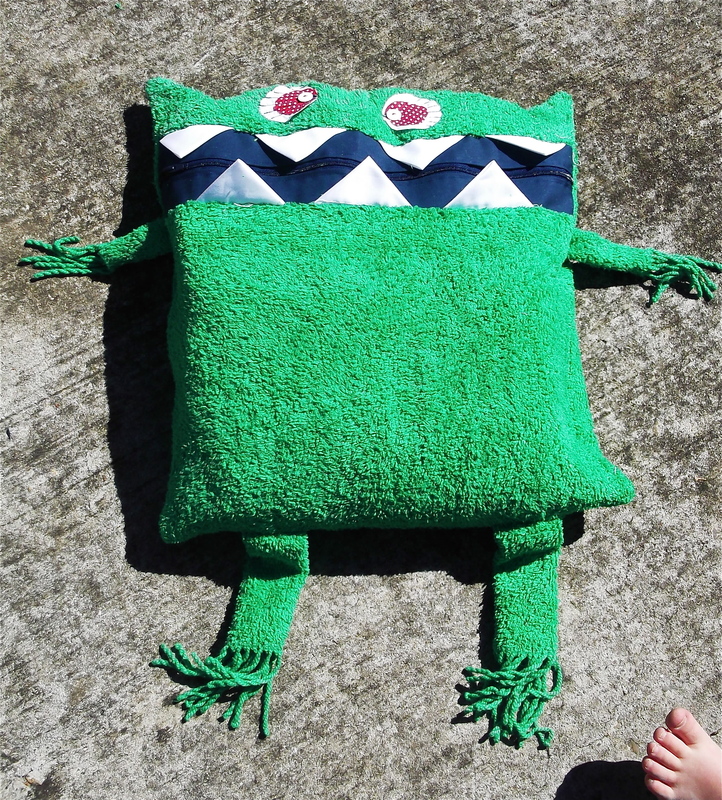 …and more recently I have been making monsters. You can see a tutorial here if you would like to make your own. For this particularly creative 9 year old boy, I joined them together. I’m particularly loving the eyes! The monster fort mash! ….and a cheeky foot. Would the 9 year old boys in your life like these? A quick and easy idea…… Thanks Curbly. Use me for a library bag, PJ bag, music bag, laptop bag…. things I haven’t thought of….bag. 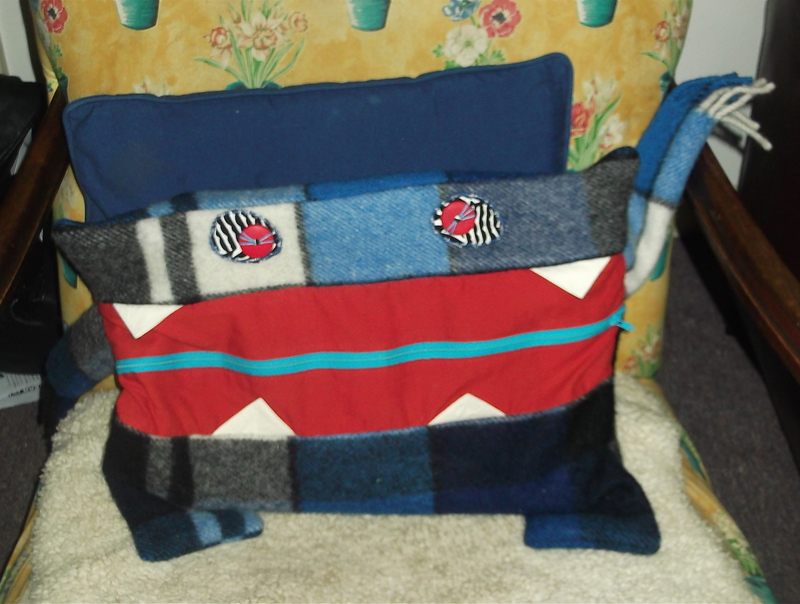 Tutorial for A4 size monster…..
an old blanket or bedspread with tasselled edge. small amount of fabric for eyeballs. thick thread for sewing o the eyes. 2. Fold each piece in half length-wise and iron. 3. 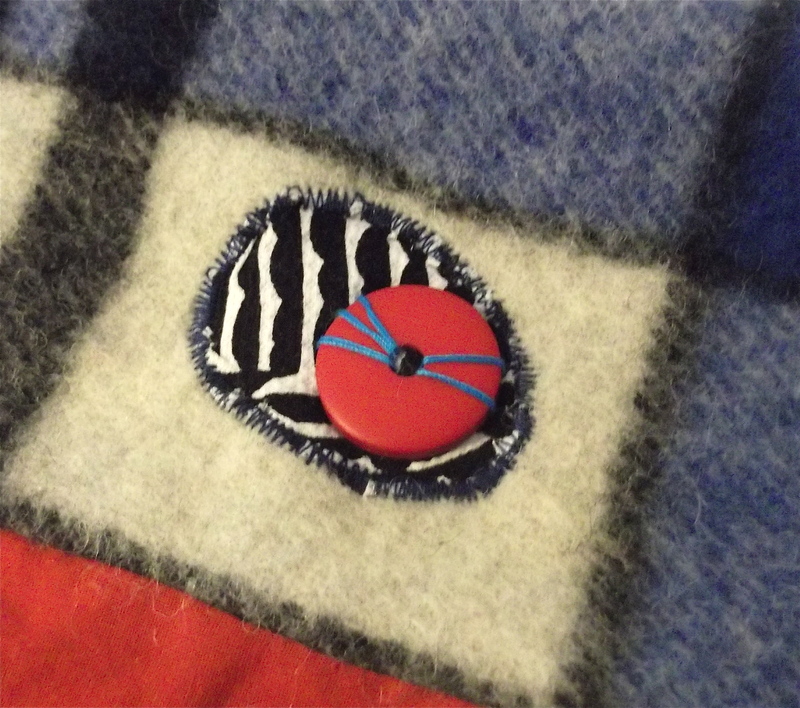 Pin folded edge of red moth rectangle to zipper on either side. 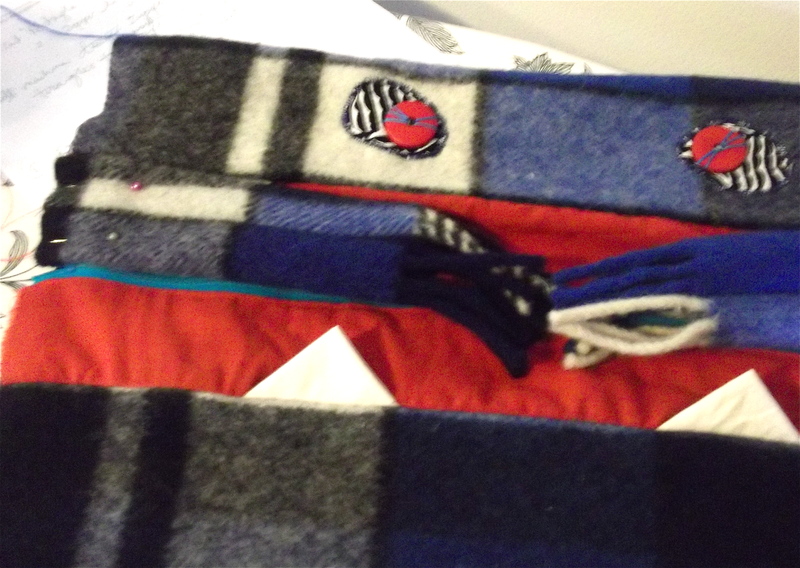 Machine the folded edge to either side of the zipper….. but not too close. hint: The further your fabric from the zipper the less likely it is to get caught when opening and closing….and exposes the zipper more, which is what we want in this case. Cut 4 (or more) 8cm x 8cm squares for the teeth. 2. 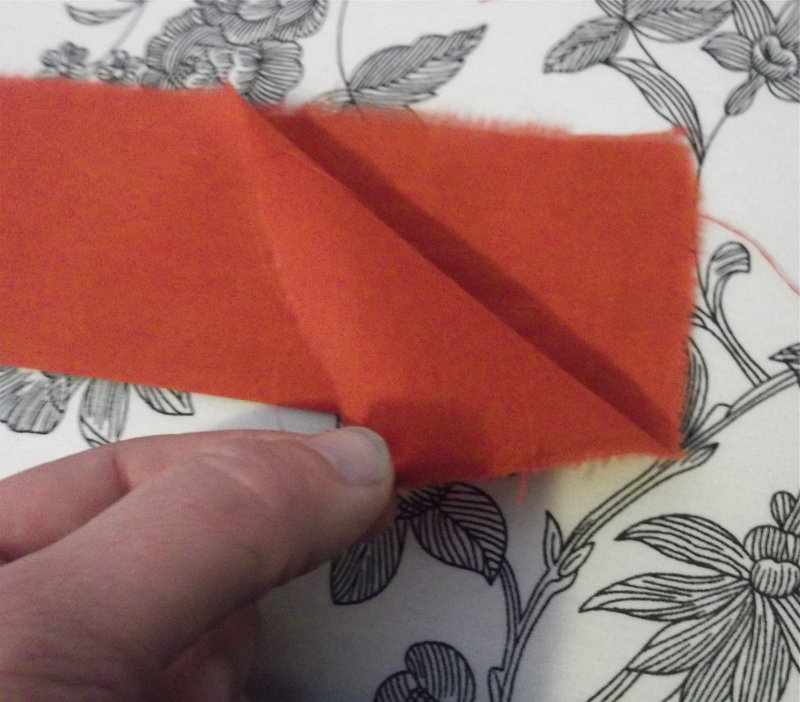 Fold in half diagonally and iron…..
….. fold in half diagonally and iron again. 1. Cut 2 rectangles 25cm x 14cm along the fringed edge. The measurements include the fringe. 2. 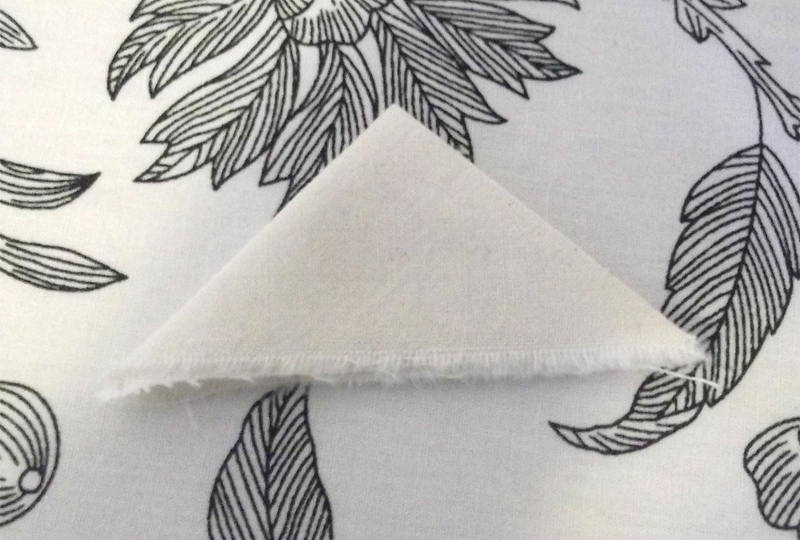 With right sides together, machine down the non fringed edge with 1.5cm seam allowance. 3. Turn back to right sides… forming a cylinder like shape. Press with the seam down the middle of the arm. 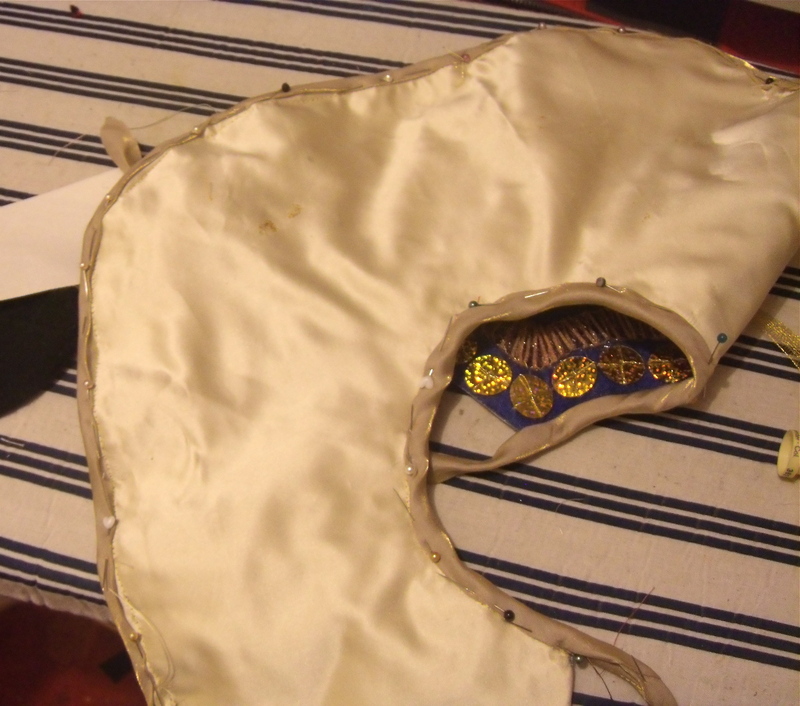 (this reduces the bulk in sewing it together later). Cut another rectangle 49cm x 20cm. Machine (with right sides together) the rectangles on either side of the mouth piece along the 49cm edges. 4. Iron so that the teeth head toward the zipper ( press seams away from mouth on the wrong side)…..
Cut 2 circles (black and white). 2. Position them on the smaller rectangle above the mouth. 3. 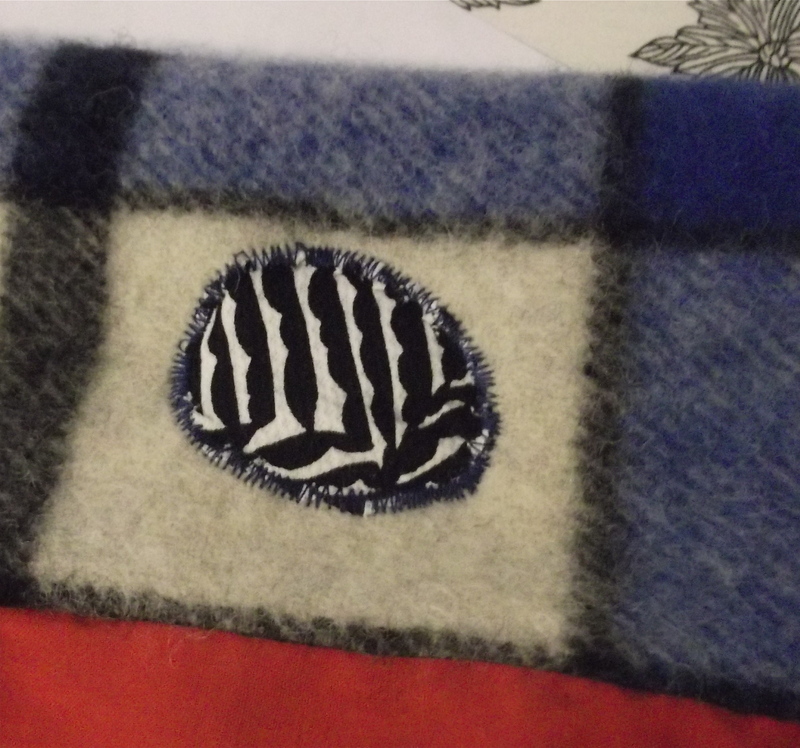 With a needle and thick thread position and sew on the eyes. 1. Position the monsters arms where you would like them. 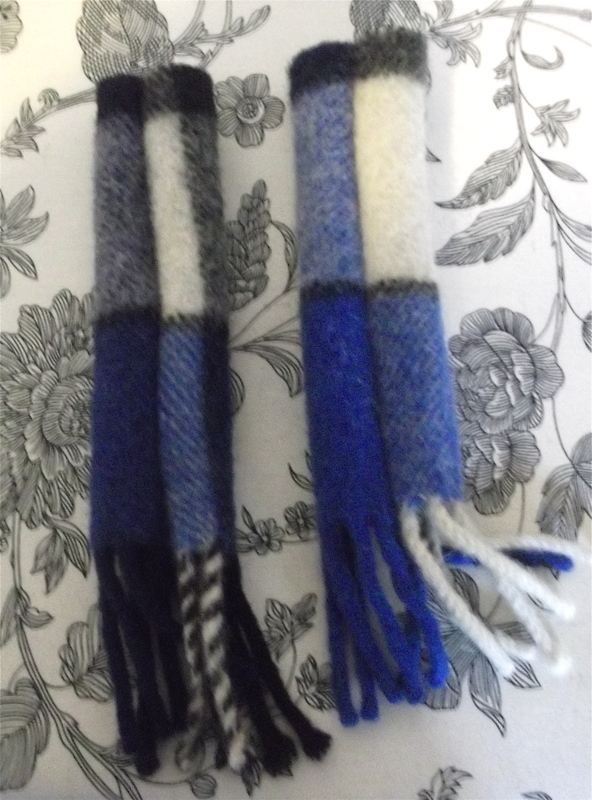 Position them with the fringing toward the middle and with the seam facing up. 2. 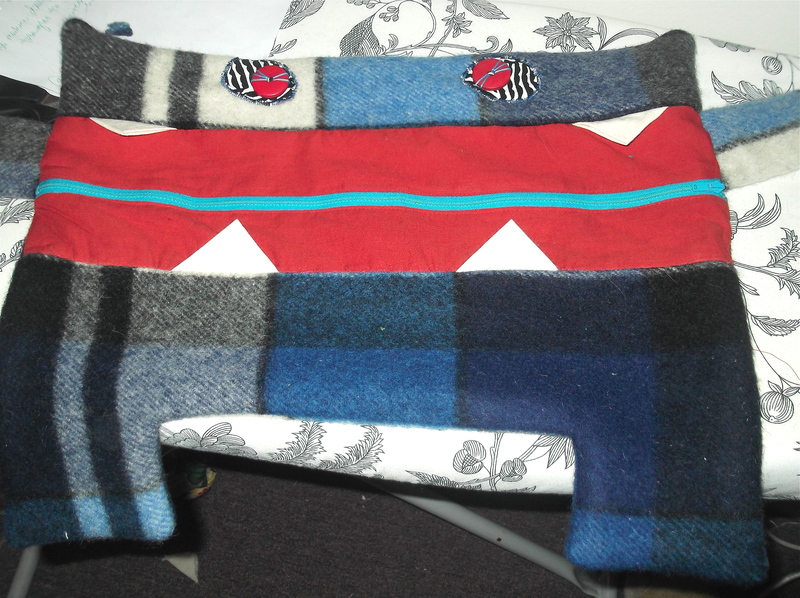 With right sides together and zipper open about 10cm, line up the cut edges of the triangles to form a large rectangle. Pin. 3. Machine the sides together. Stitch the seam again where the arms are positioned to reinforce them. 1. Along the bottom edge create the legs by measuring across 12cm from each side seam and putting a pin….then up into the monster 12cm and placing a pin. 2. 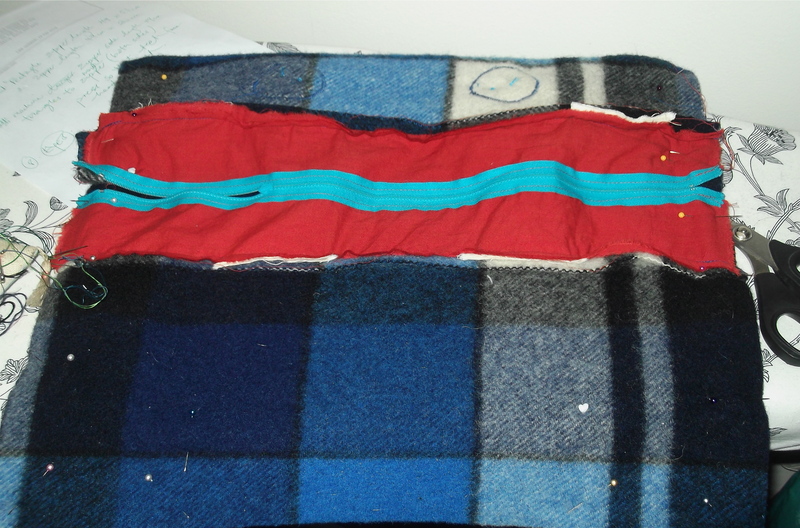 With a ruler join up the dots and cut through both layers of blanket to create the leg shape. Machine together along the newly cut line. Seam allowance 1.5cm. Now for the top (horns). Coming diagonally down from the top corners about 3cm and put a dot ( don’t come lower than your eyes) draw a line from one dot to the other using a ruler. This is your machining line. 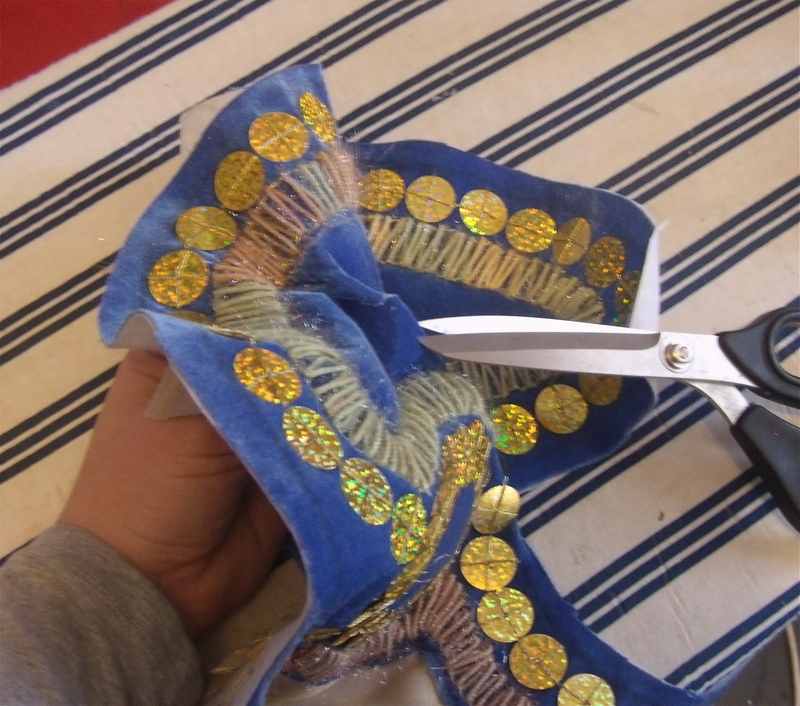 Trim excess fabric from the corners being careful not the cut your stitching. 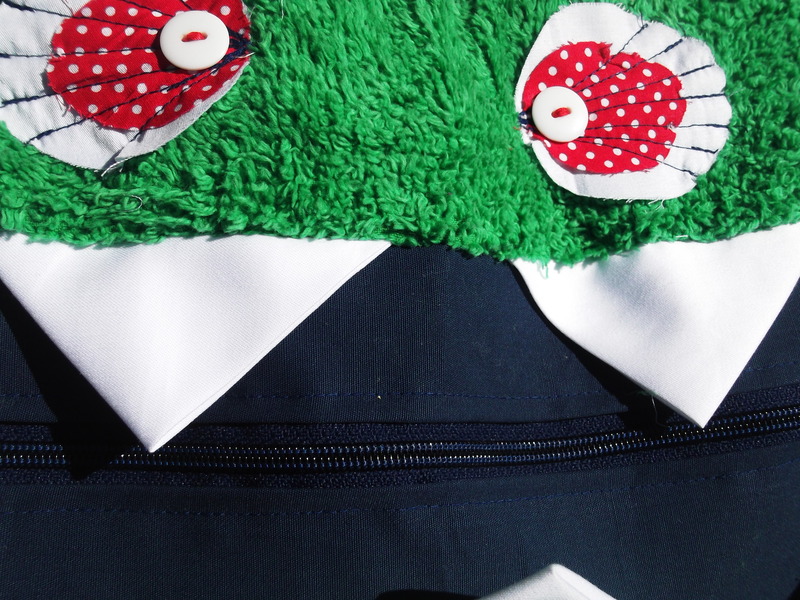 Turn your monster inside out through the zipper hole. Push the horns and legs out with the end of your scissors to get a nice point. 5. Enjoy and love your monster. Hatshesup costume from last year. 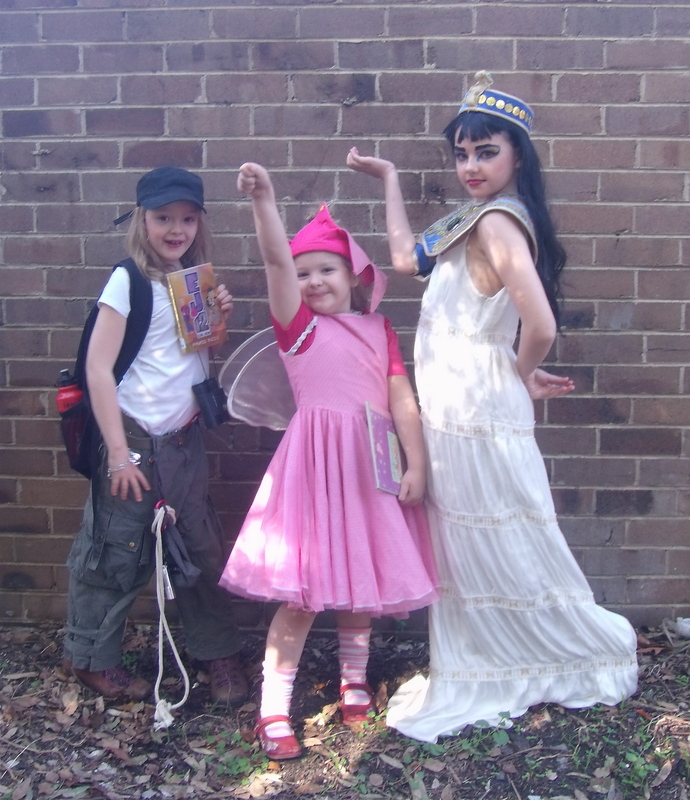 It is my habit to only make one costume a year for book week and for all the rest to come from our dress-up box…. or someone else’s. This keeps the cost and stress down, and helps the kids get creative about which character they want to be. 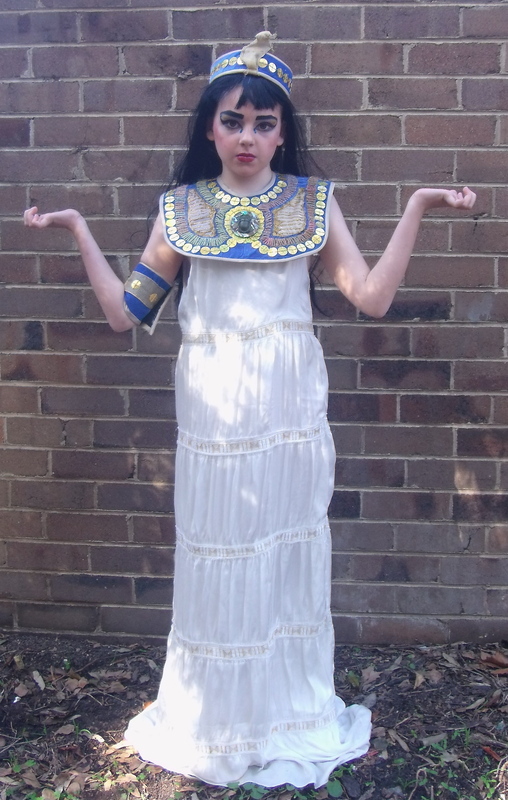 Last year it was the 11 year old (now 12) who got a special costume made. 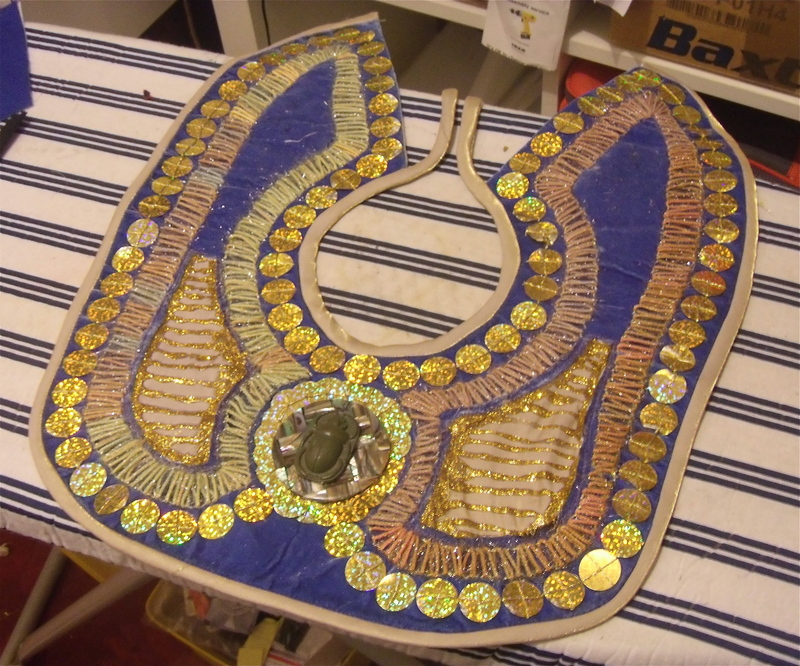 I though, just in time for this year I would share a tutorial of how I made the bib. If you want to create one and don’t sew, you can follow the along, but just use cardboard as the base and instead of stitching the finishes on, use glue. 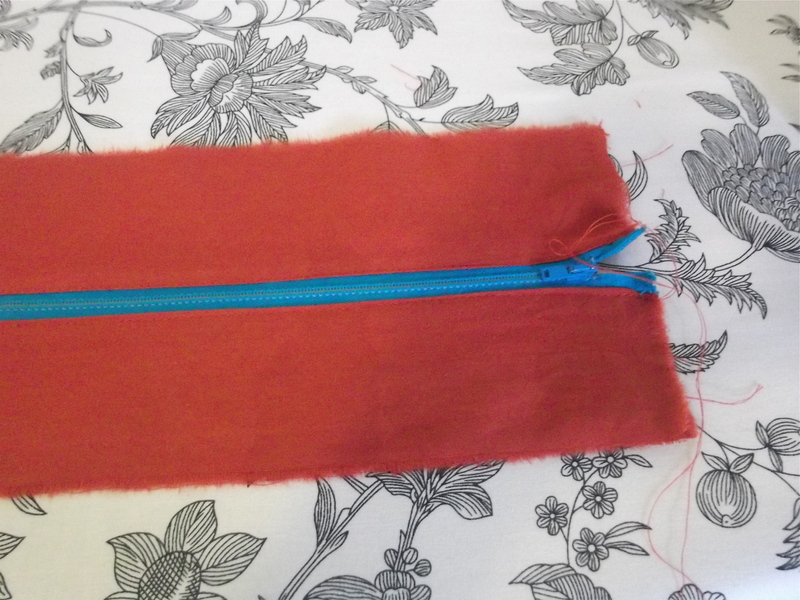 If you do it this way there is no need for lining or binding and would be much less time consuming. So with no further chatter……..
pencil, scissors, sewing machine and thread. 2. 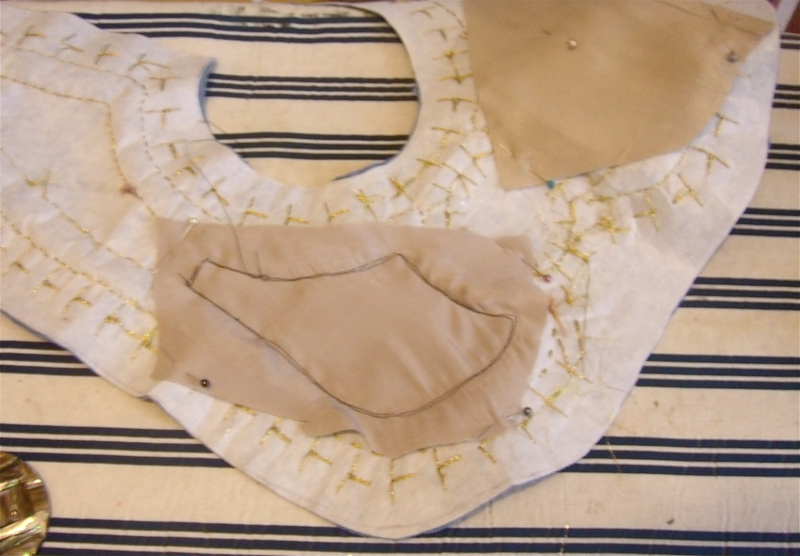 Using the measurements given create this shape (It is half of the bib…. doing it this way means you get a symmetrical result) Click on the image to enlarge. 3. 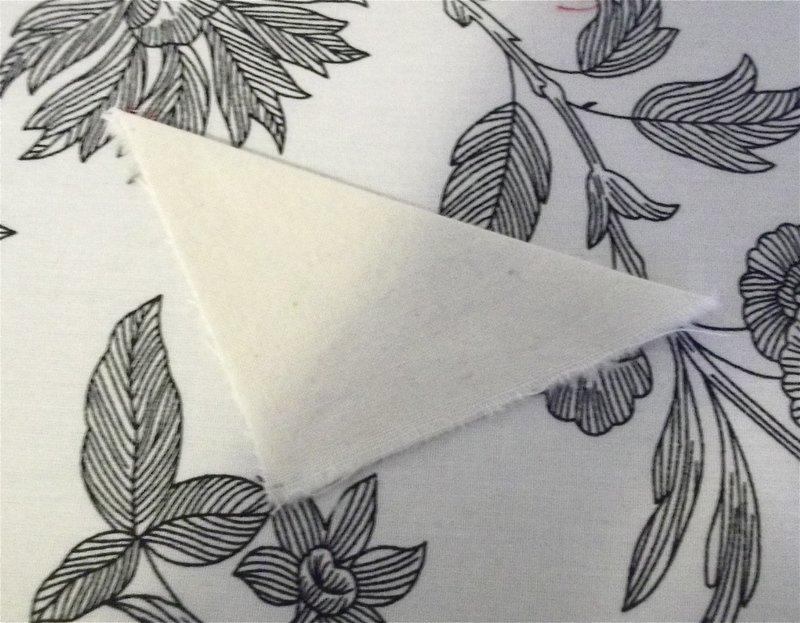 Folding your base fabric in half and placing the fold on the edge marked “place on the fold” cut the basic shape. 4. 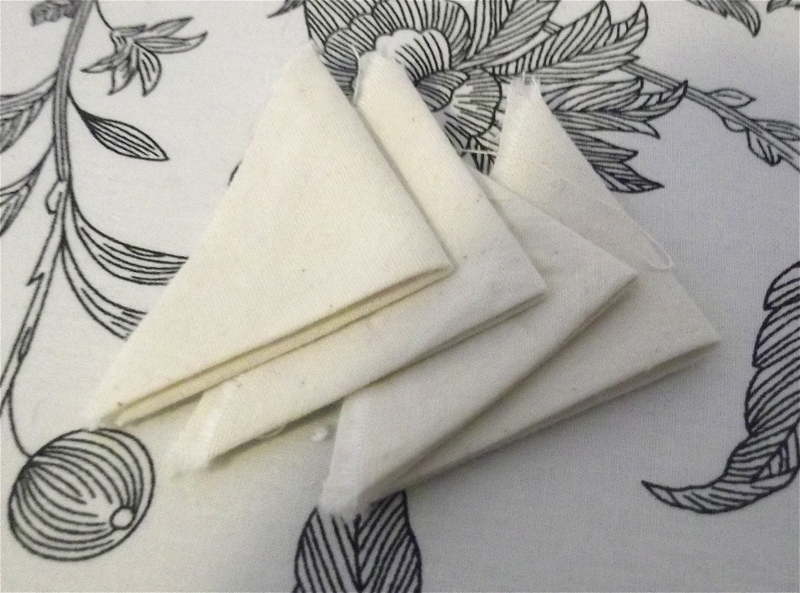 Cut another of these pattern pieces in the same way for both your lining and interfacing. 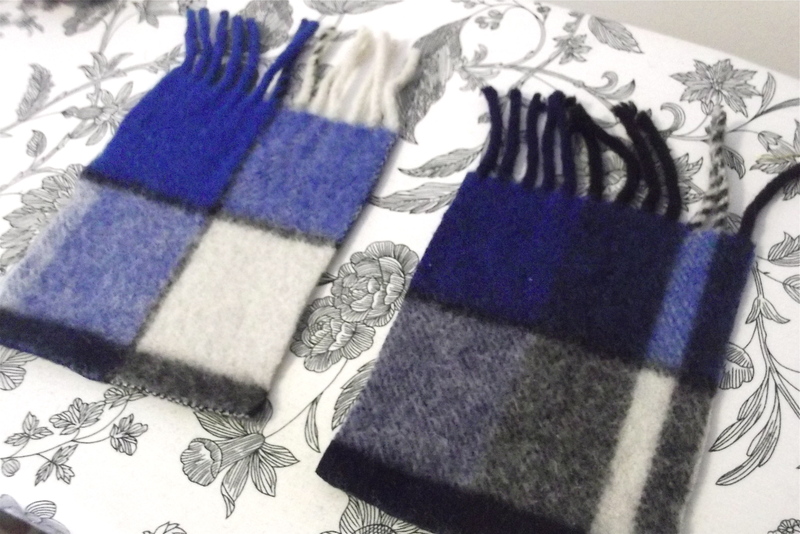 You should now have 3 different coloured fabrics (base, lining and interfacing) all the same shape. 5. 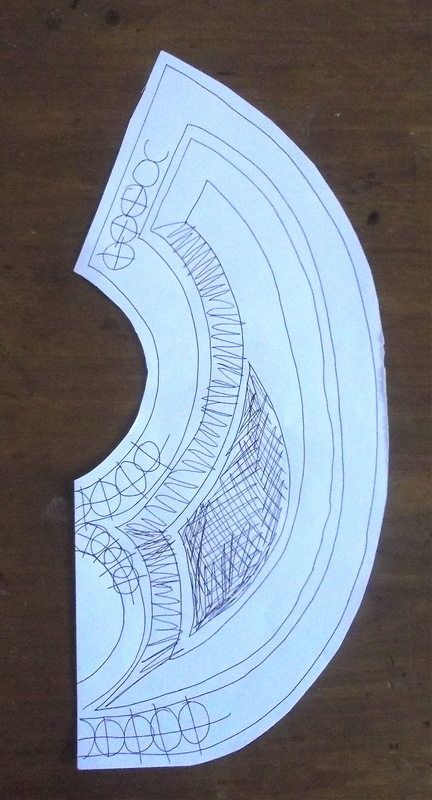 Back on your pattern piece sketch out an idea of how you will lay on your ‘design’. Egyptian patterns are very repetitive and tend to follow the shape of the item. Start about 1.5cm in from the edge (this is where your bias will be sewn) and create a design that works towards the centre. Make sure you leave some of your background fabric to show through. 6. 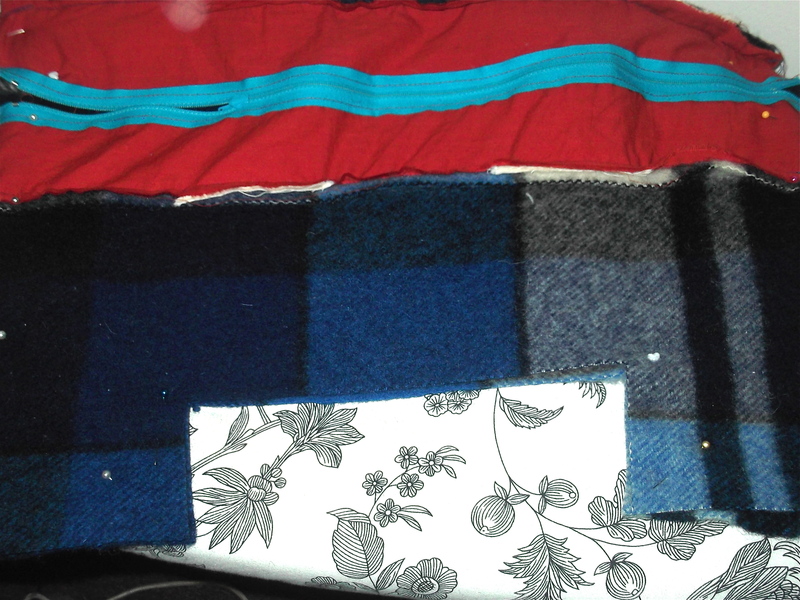 Put your lining to one side and just work with your base cloth (blue) and your interfacing now. 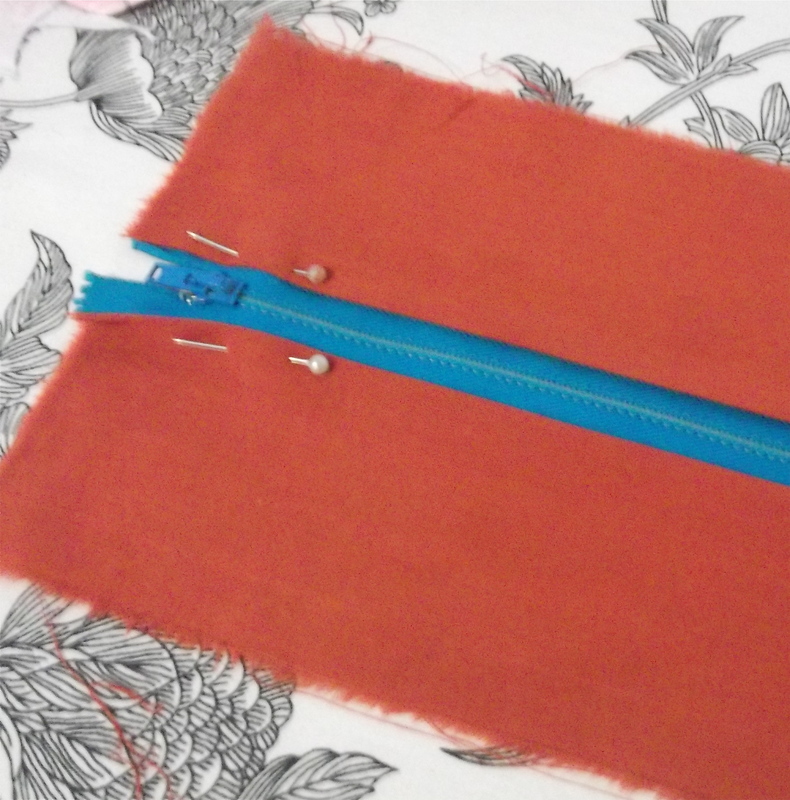 Iron the interfacing to your base cloth (wrong side of base fabric to shiny side of interfacing) using a dry iron. 7. 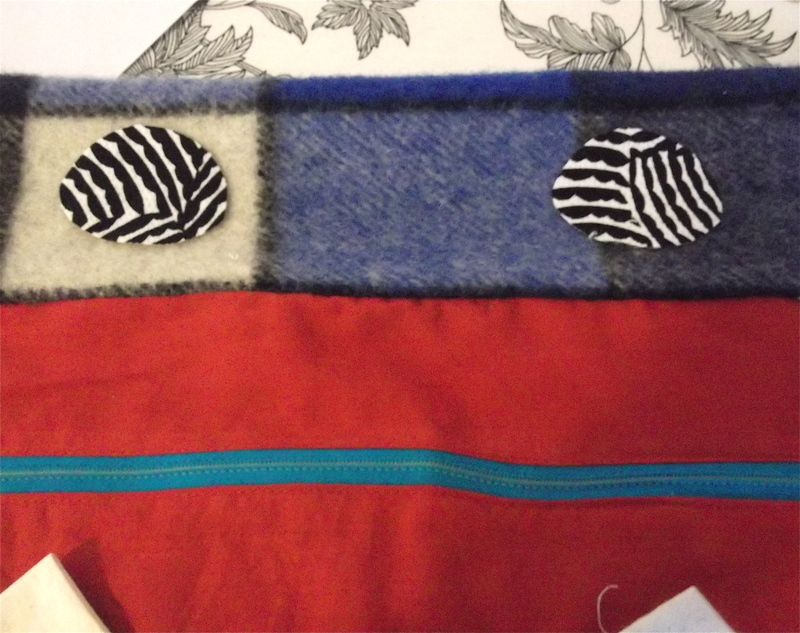 Transfer your design onto the interfacing. 9. 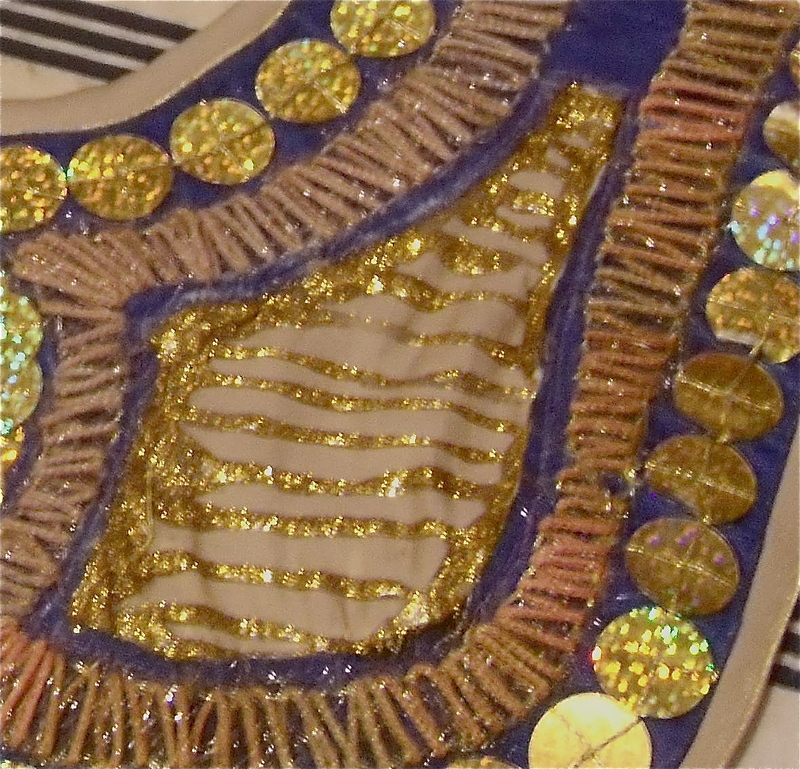 Place your other gold fabric behind the area you want to reverse applique ( have it show through) Sew, with a machine, the shape you have designed from the right side of your bib. Do this to both sides of your bib to keep it symmetrical. 10. 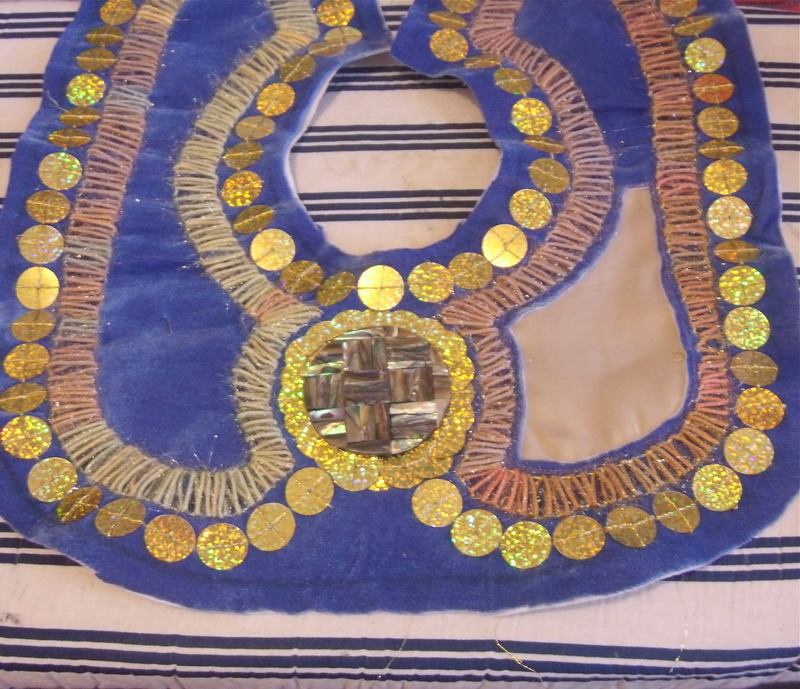 On the decorated side of your bib lift the base fabric away from the gold fabric you have just sewn on. 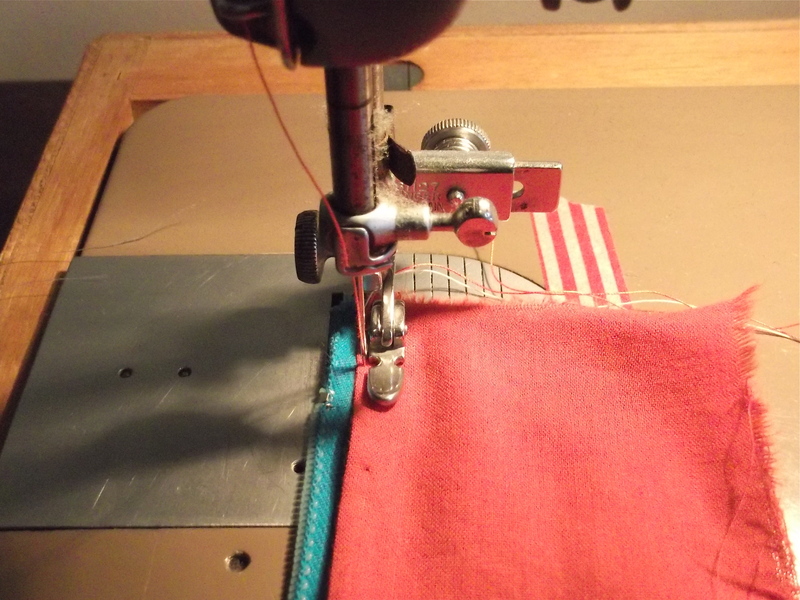 Carefully cut away the base fabric very close to your machine stitching. It should look like this…..
11. Paint your reverse appliqued sections and allow to dry. 12. 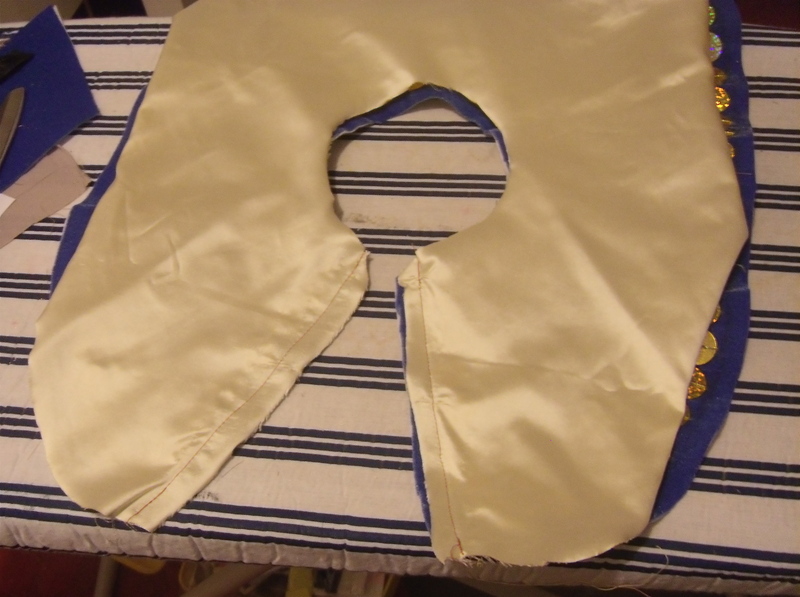 With right sides together lay your lining onto your bib. 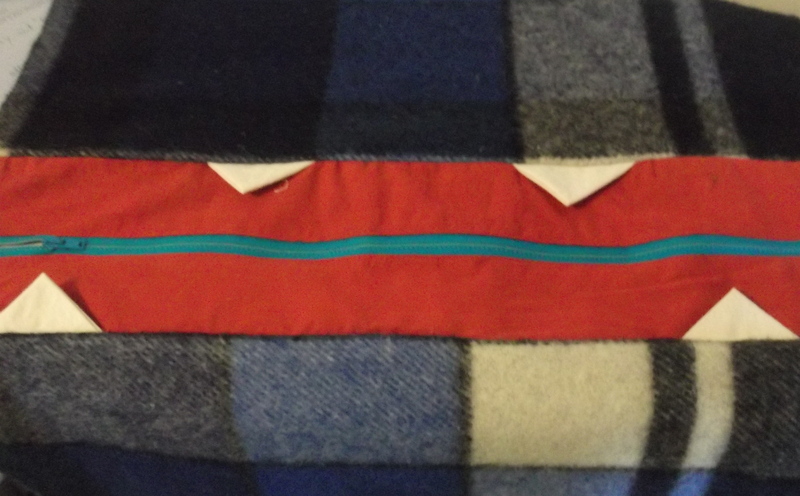 Stitch the straight edge with 1cm seam allowance. 13. Turn bib so that the wrong sides are together. Give it a really good press with the iron. Be careful of the sequins as they can melt! Best to iron from the lining side. 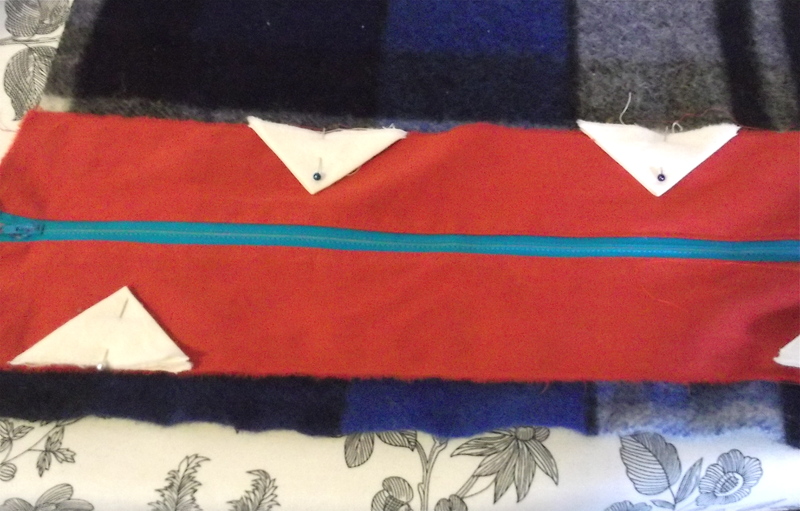 Pin lining and base bib together at neck edge and outside edge. 14. 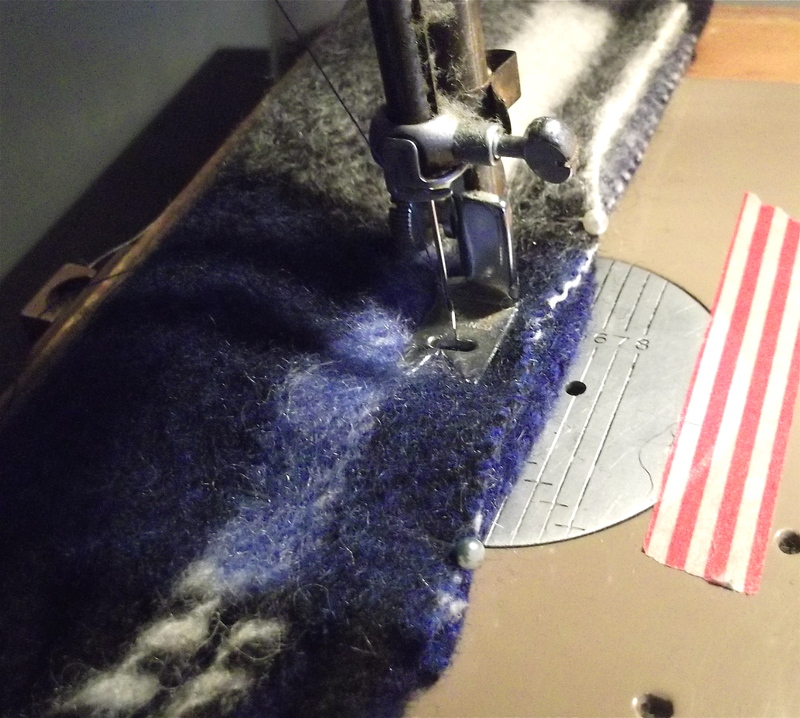 Machine your bias binding around the outside edge. Do the same with the neck edge leaving 15-20cm at the beginning and end of the neck edge. This will be your tie to secure it around the neck. Fold over to encase the cut edges (trim if you need to) and pin. 15. Using slip stitch, hand sew the bias binding down on the lining side. Tie a knot in the neck edge bias strings to secure. 16. Now, if my directions are clear, you will have your own unique version of this. 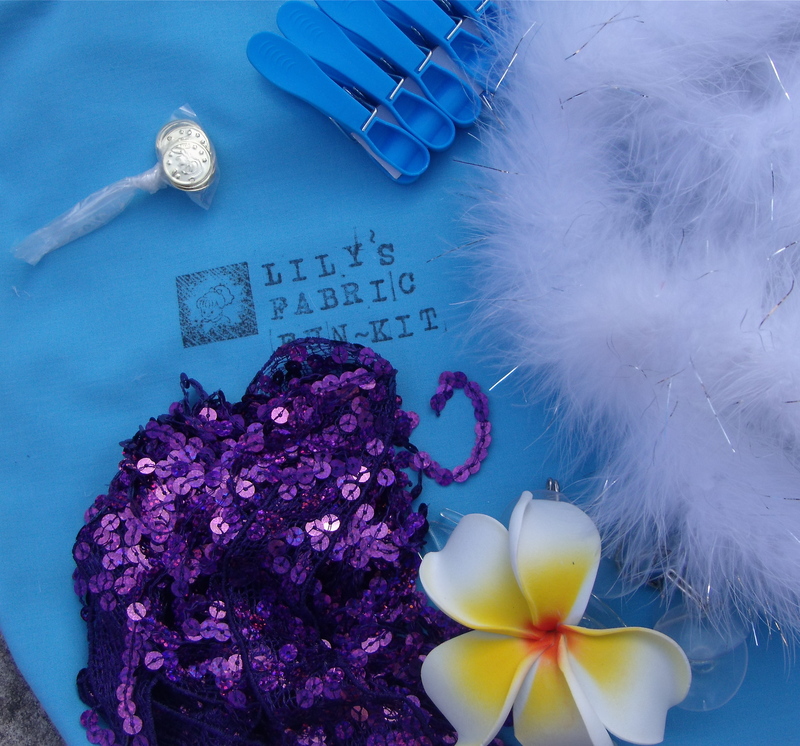 To complete the costume use the fabric and decorations you have left over to make a headband and armbands. 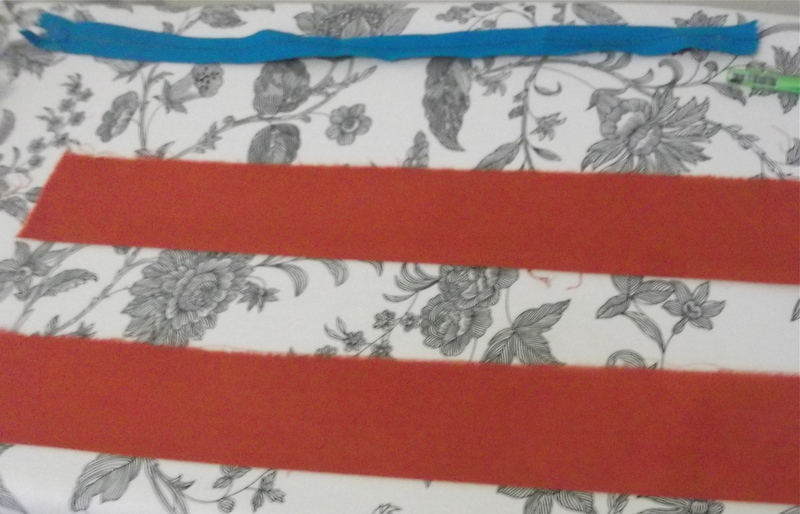 Strips which velcro together. Wear over a long thin white dress (or a white sheet worn in a cylinder shape) with a straight black wig and go nuts with the eye make-up. Let me know how you go. I’d love to see your creations. Image from The Crafty Cow. 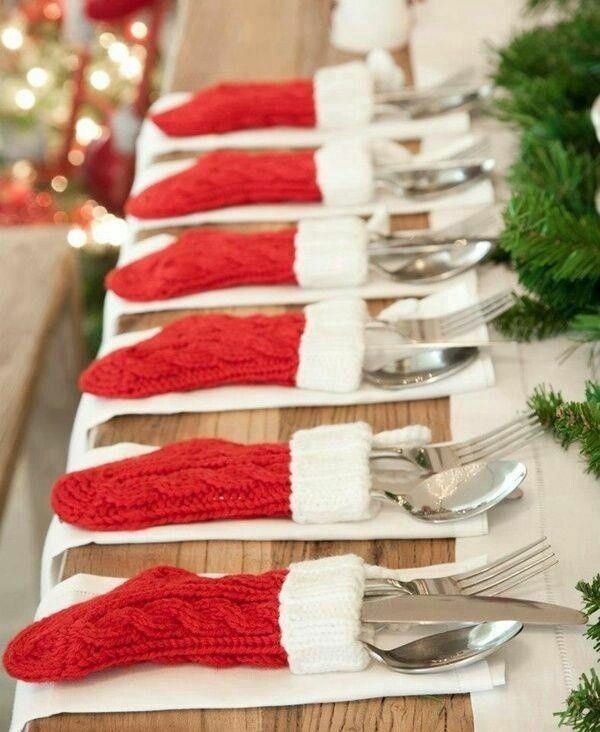 A great idea to think about for the upcoming holidays. Click on the photo for the original post and a printable world map template to help your making. Mad Science Party….. thanks to the internet and some very generous geeks. The gorgeous birthday girl with the jelly cake that did work. Photos by the lovely Charles Francis. 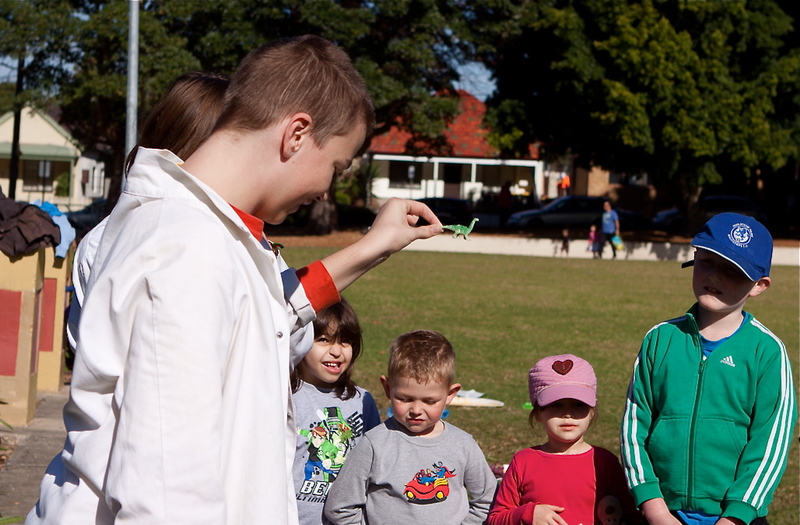 Our excitable 6 year old enjoyed a crazy mad science party a few weeks ago now. When she suggested the idea I was a little out of my depth….. not having enjoyed science that much through school…. so I did what I do best and searched the internet for party ideas. Tim also had the great insight to ask some family friends of ours to help with the activities. They are a family full of crazy, fun, sciency folk and they did a marvellous job of entertaining and exciting the masses. Because I was so thankful to all the people out there in cyber space posting their great ideas for me to use ….I thought would put all the links together in one post for you to use and steal and enjoy. The invite was made using the excellent Smilebox. So easy , and so free! Playing with IT…. the slimy stuff. Norfolk Kids have a great recipe for custard powder gooey slimy stuff! The super geeks preparing the rocket for launching. The water rocket was a great hit with the Dad’s and the kids. The Aquapod bottle launcher could quickly become a family favourite. The launcher is safe and with just a bike pump and water sends the rocket about 100m in the air. ….. a little palaeontology anyone? Wack with a hammer to reveal a dinosaur inside. A hit! 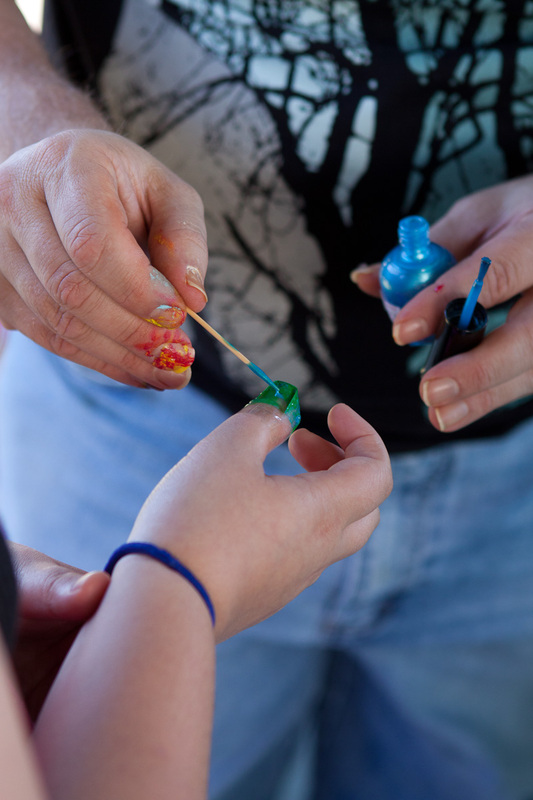 …similar ideas at Kids Activities Suite 101. …a little something like this. 6 year old in her scrubs playing with ‘squishy circuits’. ‘Squishy Circuits’ are the brainchild of AnnMarie Thomas. See her TED talk here. These are super cool!! 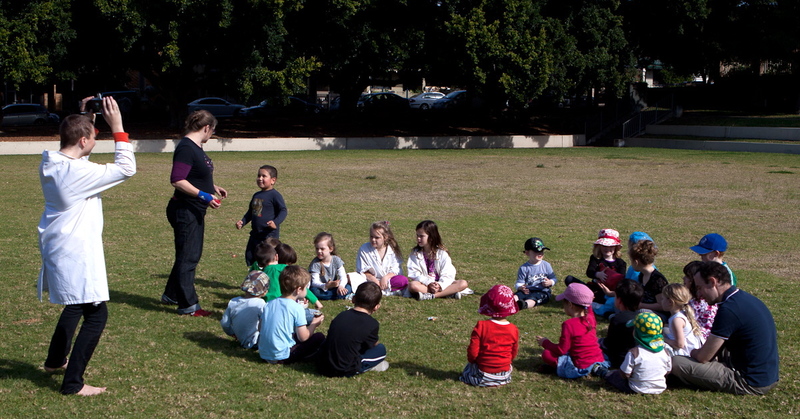 Yes, it’s an old faithful….pass the parcel. The treats inside included ‘Smarties’ and ‘Nerds’ and crystal stickers. No link here. I adapted this game all by myself. Even when we really had no idea what we were doing we looked the part in our lab coats. These came courtesy of the high school our friend works at. They had authentic chemical stains. 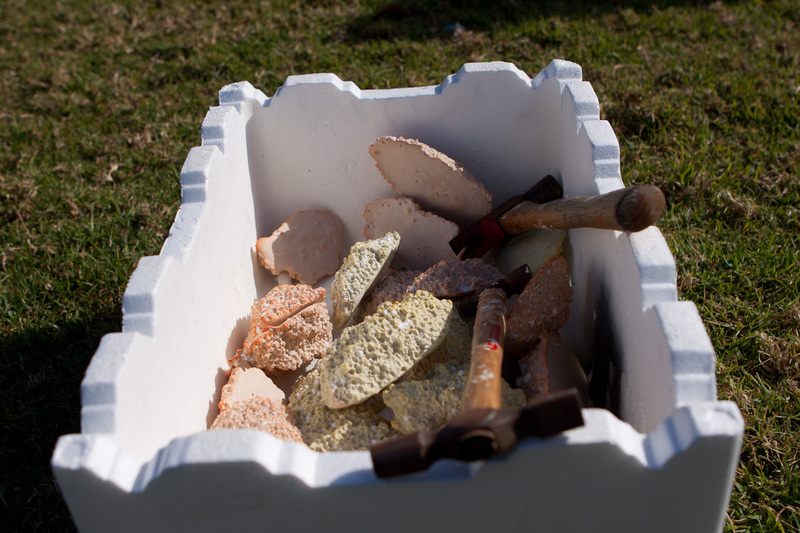 Making ice-cream to eat with our birthday ‘cake’….which was actually jelly. BIrthday girls looks a bit sceptical about this one. We jiggled and wiggled to science music making our ice cream. You can find the recipe here. ….ooops just realised that you all have seen this outfit before on a different birthday girl. Yes the girls do borrow each others clothes. An exploding (not really) jelly cake. Inside the test tubes was a jelly snake, and it’s hard to see but the jelly was layered lime aqua and pink. A very cool and easy way to layer jelly. The link is down but you can see from the images here how to do it. All you need is a muffin tray. It doesn’t show fully in the photo but these drinks were colour layered….it’s all to do with sugar content. I found this cool idea at the sisters cafe. It also works in a larger jug. A little difficult to see….. ‘Build a molecule’ tray of round food and toothpicks. Also little specimen cups full of jelly. The ‘build a molecule’ idea came from Come together Kids. This blog has lots more ideas re:science party. 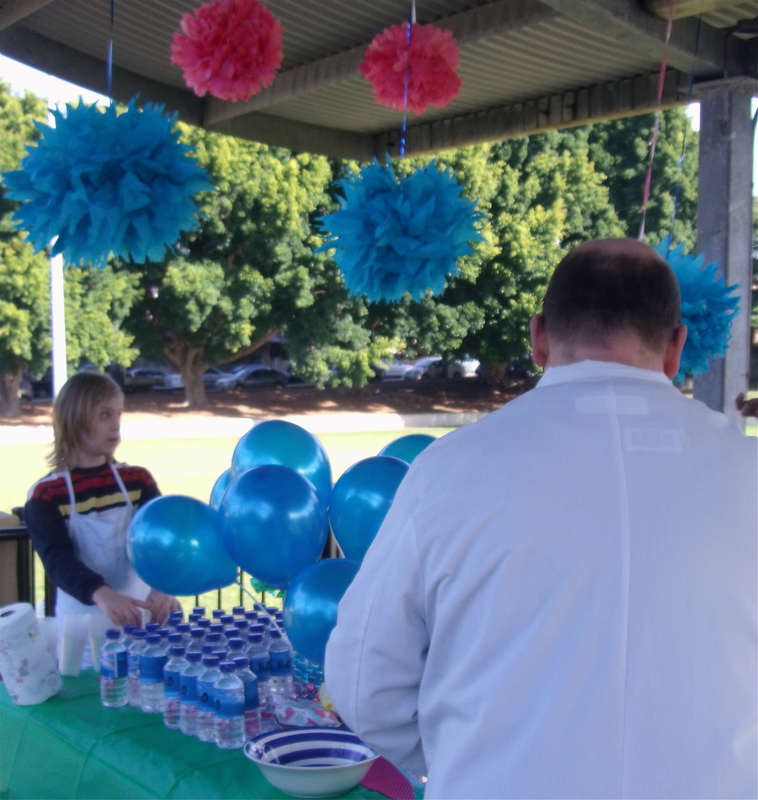 Balloons and flower balls as party favours. If you look closely you can see the water has H20 labels. I have talked and made these tissue paper balls before. The instructions can be found at Martha Stewart (I couldn’t do a party without her) and the idea for re-labelling the bottles of water from Kara’s party ideas. 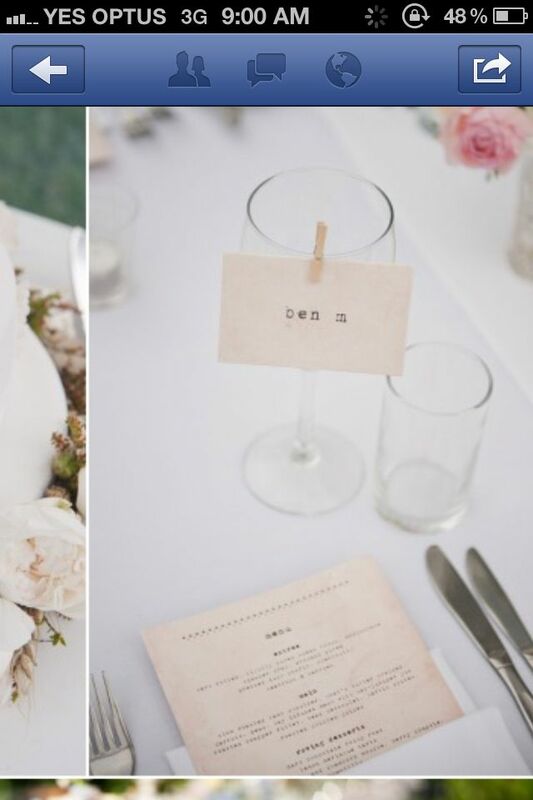 As you could imagine ….there are lots more ideas for different parties to be found here. 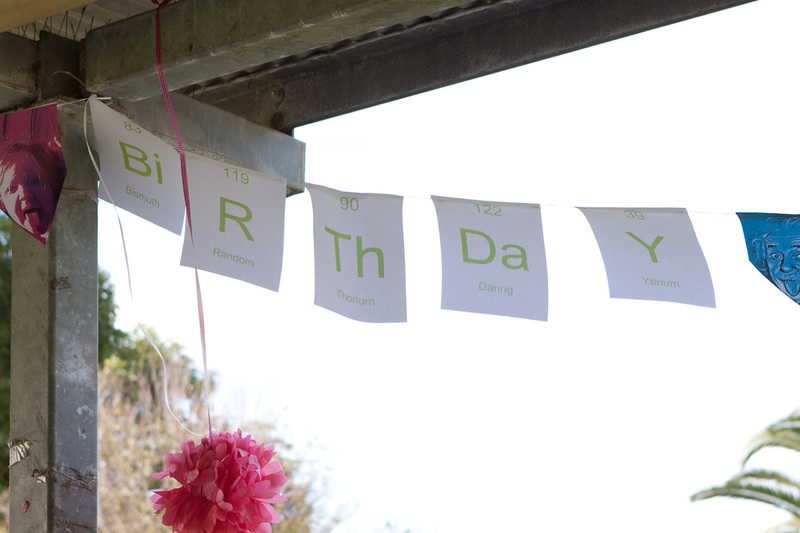 Last of all 13 year old and I made bunting of real chemical elements (with a few made up ones). Were you aware the R is the element Random and Da is the element Daring? The idea for the bunting came from Apartment Therapy. 6 year old in excellent company…… mad scientist together. 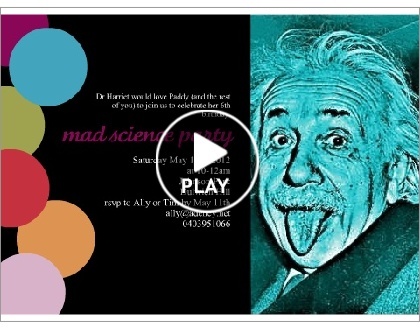 I used the image of Einstein from the invitations…… then photographer 6 year old doing the same face. 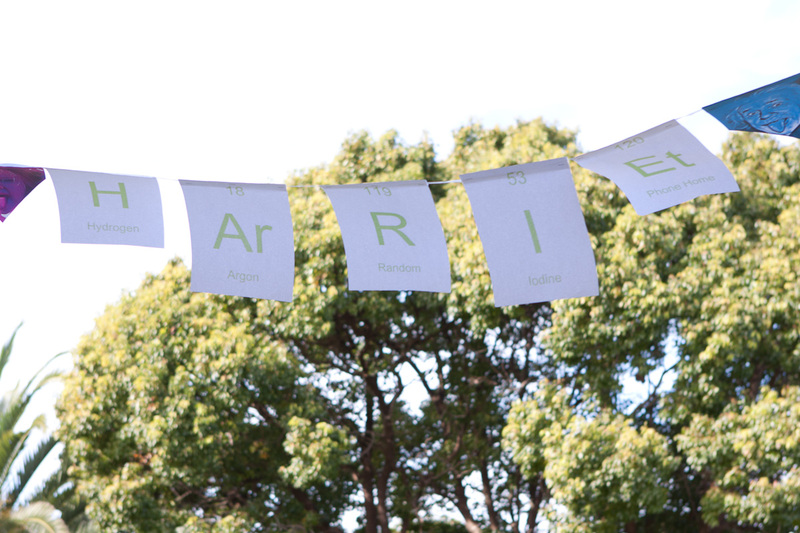 After a short fiddle with the colours in photo shop….. we had our bunting. How do you start putting together ideas for a themed party? What are the best ones you have ever hosted or been too and why? 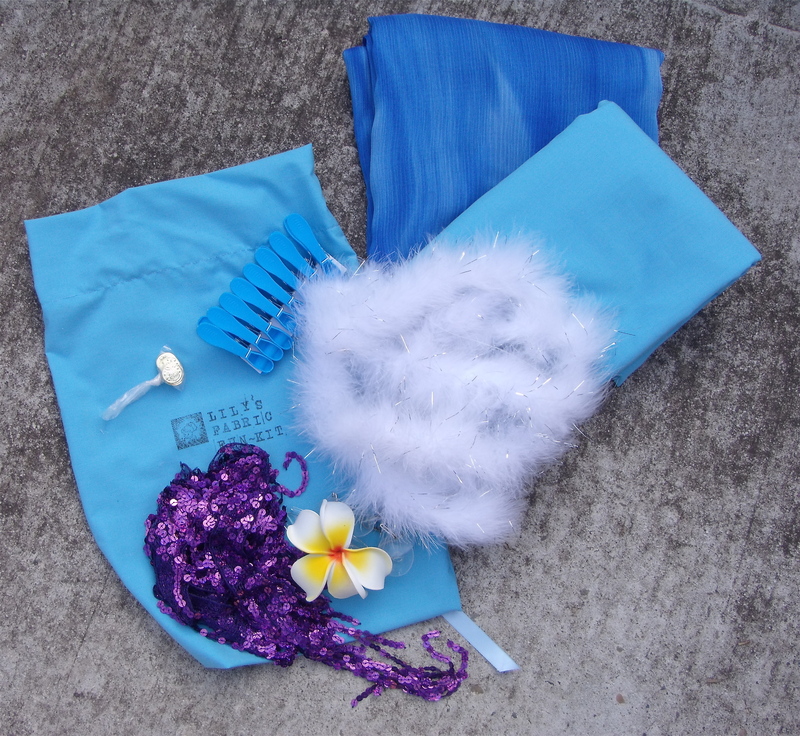 Underwater fun-kit for a 6 year old. The finished product. No extra wrapping required. In keeping with the making of gifts idea from previous posts…. I attempted a variation of the Fort Building Kits by Saltwater Kids posted in a great big list of gifts for boys and girls last Christmas. I have been wanting to try these for ages, and I am pretty sure I will make more after this success. The theme of the party was mermaids…. 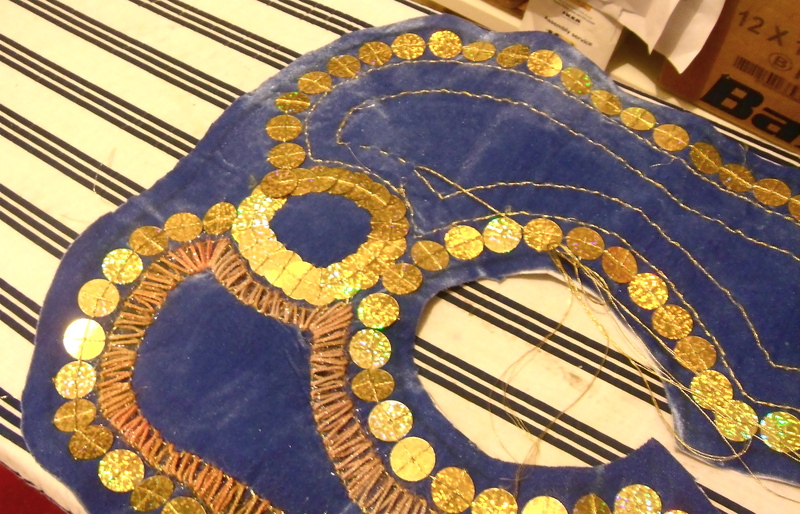 so I purchased fabric appropriate to the sea, included some sequin length, white fur trim and a few gold coins to contribute to the sea idea. 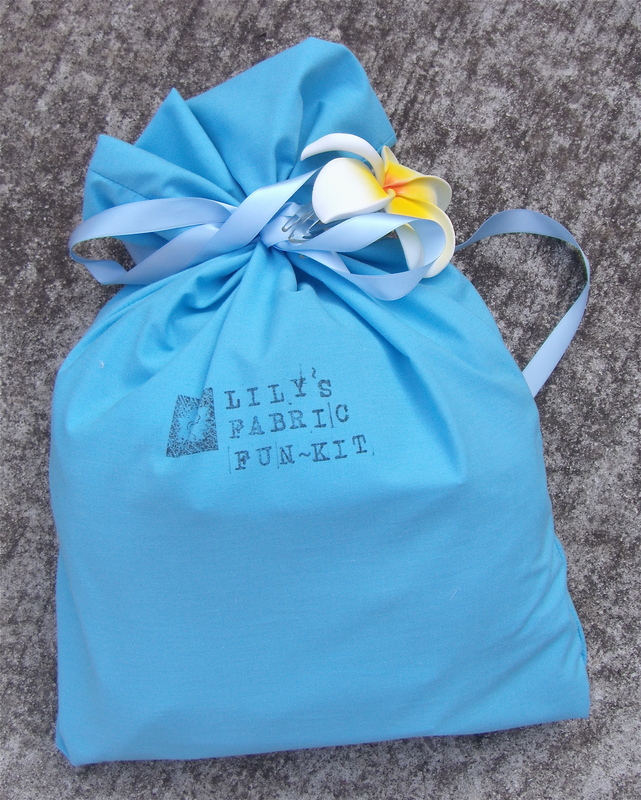 Because I wanted the lovely Lily to be able to use it for other creative play, I decided to call it a fun-kit rather than a fort kit in the hope that it would open up the imaginative possibilities rather than close than down. I imagine her using the contents not just for forts but backdrops for ‘shows’, dress-ups, dancing, picnics or playing mermaids or other sea creatures. I included a frangipani hairclip just….because it was gorgeous. One fabric was a sea blue cotton and the other a watery print blue chiffon. ….I hope she enjoys playing with it as much as 8 year old and I enjoyed pulling it together. Her mum sent me through this photo of an early incarnation of the fun-fit. 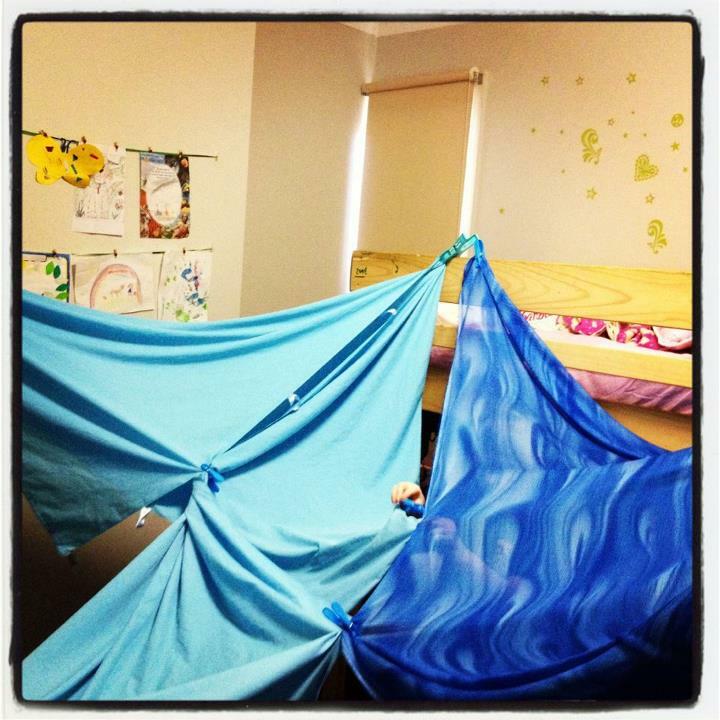 An early incarnation of the fun(fort)-kit. Thanks Laura for the picture.